It’s The Postseason! Here Comes The Cardinals Bashing Again! After breathing a sigh of relief on Sunday after the Pirates lost to the Reds (and ignoring just how it happened) and then watching the Cardinals celebrate their second-straight NL Central championship, we fans can now just relax and enjoy and wait for the National League Division Series to begin on Friday. Right? Sure … as long as we ignore what’s now become an annual ritual: Cardinals bashing. Ah, yes, tomorrow is October. 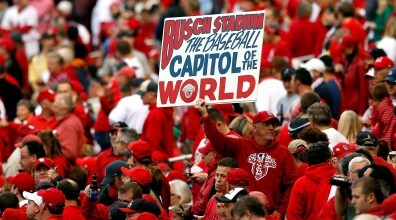 Time to mock the Cards, and Cards fans! And it begins with no less an astute publication than the Wall Street Journal, which published “The 2014 Baseball Playoff Hateability Index” yesterday. Although I’m not exactly sure we can call this quite the astute publication it used to be. Right now, on the WSJ.com website, the second-most popular video — right after “Aerial Drone Captures Scale of Hong Kong Protests” — is “George Clooney, Amal Alamuddin Wed in Venice” (which you can find here, if you’re so inclined). Shockingly (ha ha ha), the Cardinals are the only one of the 10 teams listed to earn a point in that category — and the more points, the more hateable the team. You really can’t do better than that, Wall Street Journal? Although there’s one category I agree with the Cards getting a point for: excessive beards. As great of a guy as Jason Motte is, that thing on his face has only gotten worse since he returned to the roster in May. Then there’s the category where the Cards have double the points of the only other teams earning points, and that’s probably the reason for all the hatred anyway: success. The Cardinals, as we’re well aware, have four pennants in the past 10 years — 2004, 2006, 2011 and 2013 — and thus earn one point for each. The Giants have two, along with two World Series championships, as do the Tigers. This is not meant to disrespect the Cardinals. This is the team everyone aspires to be: rich tradition, deep farm system, reasonable payroll, loyal fans, star players. The Cardinals’ front office makes all the right moves. Their players are generally bright and likable. But they really do seem to win all the time. They’re more like the Yankees than the Yankees these days. Although the Tigers are the team that most deserves a World Series title? With the Dodgers second? That kind of makes the whole thing rather ridiculous. Sorry, Royals! Sorry, Orioles! Sorry, Pirates! All your success droughts don’t mean very much to the New York Times! Those Tigers with their trips to the World Series in 2006 and 2012 are much, much worse off! There probably are already other Cards-bashing articles, posts and the like out there, and there will no doubt be more in the days and weeks ahead — especially if the Cardinals repeat as National League pennant winners. And while it’s annoying to now be the subject of scorn at this time of year, we can look back at our 2006 and 2011 replica World Series rings and wear our 2004 or 2013 NL Champion sweatshirts while knowing the reason behind it really boils down to one thing, and one thing alone — and that very thing the Gin Blossoms sang so well about back in 1992. This entry was posted in 2014 Cardinals and tagged 2014 postseason, Best fans in baseball, Jealousy, New York Times, Wall Street Journal by Christine Coleman. Bookmark the permalink.